WordPress is a highly versatile and user-friendly CMS or Content Management System. It is used by Fortune 500 companies like eBay, Reuters News, and GM. Over and above the who’s who of the Fortune 500 companies, WordPress is also used across the web by more than 7.5 million sites. Although WordPress is really easy to use, sometimes some common issues may crop up. 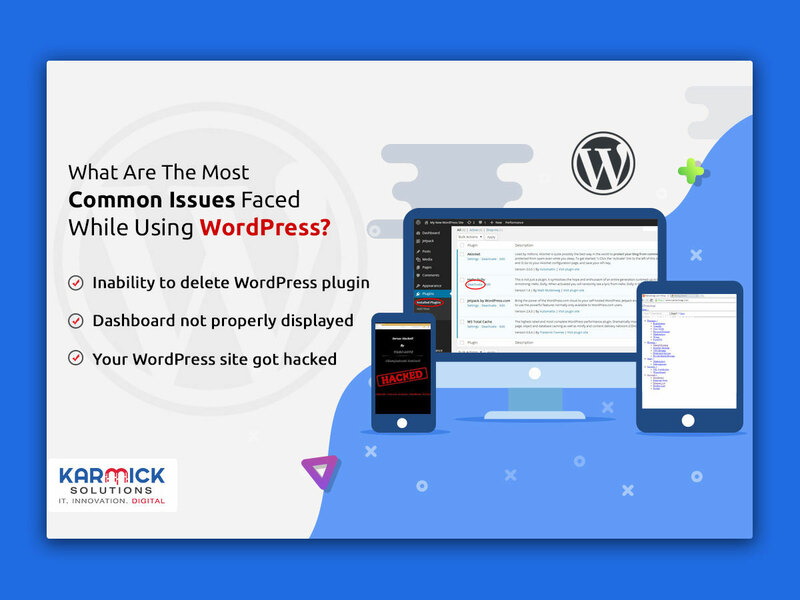 The good thing about WordPress errors is that owing to its vast community of users around the world, there is hardly an error that hasn’t already been encountered and addressed before. In this blog, we are going to discuss some of the most common bugs that all WordPress users and ways to tackle them. Sometimes, users are unable to delete the WordPress plugin in the admin panel. Even if they try to delete the directory via FTP, the plugin still re-appears. To delete the plugin, using SSH, log in to your WordPress site. You can use Bitvise SSH client if you do not have one. Your host provider will get you your access details. Navigate to “./wp-content/plugins/” with the help of SSH commands. To show the complete folders’ list, use Is -al. Delete the plugin folder that has the rm (Folder Name). Once the aforementioned steps have been executed, log out and then log in again. The stubborn plugin will no longer be visible. A very common issue that regularly plagues WordPress users is that the dashboard is not displayed properly. In this kind of a scenario, the dashboard looks distorted. A proxy server or web firewall sometimes have limitations. If you are behind one of them, this issue may arise. To remedy this, you could try and latch onto the internet by switching to a different network. Alternatively, you could also try tethering via a mobile phone connection. This issue can also be caused when there is an outdated admin plugin present. To troubleshoot the same, firstly, disable all the plugins. Then, clear the browser cache. After this, log into the WordPress admin again. The dashboard will properly be displayed. Now, enable your plugins one by one until you find the one that is causing the conflict. On the off chance that you are one of those unfortunate few whose WordPress site got hacked, do not panic. It happens to a lot of people – even non-WordPress users. Can you access the admin panel? Is your site address redirecting to another site? Does the site have links that are illegitimate? Has Google marked your site as insecure? Before beginning the clean-up process, change your passwords. Next, get in touch with your web host. If you have shared hosting, your site may not have been the only one that is affected. Invaluable information such as where you could find the hiding backdoor or how the attack originated could be provided by your hosting provider. If you are really lucky, your host might even execute the clean up for you. If you have backups, restore from the point when the site hadn’t yet been hacked. Having said that, you would lose all the content that came after the hack so make your decision wisely. Delete the inactive plugins or themes on your site since this is where hackers most often hide their backdoor. Next, scan your website for hacks. Once you detect the affected codes, you can either remove them manually or replace them completely with the original file. Make sure that only you and your people you trust have admin access to the site. Remove the names of any users that you find suspicious. The newer versions of WordPress encrypt passwords with the help of security keys. To complete the clean up, generate and add a new security key to your wp-config.php file. Finish off the entire process by changing your passwords again. Like every other platform out there, WordPress has its own share of issues and bugs. Luckily for its users, the common problems that plague WordPress can be readily remedied with just a little bit of know-how. Additionally, you can always count on the vast online community of developers and programmers to come to your aid if you reach out to them.